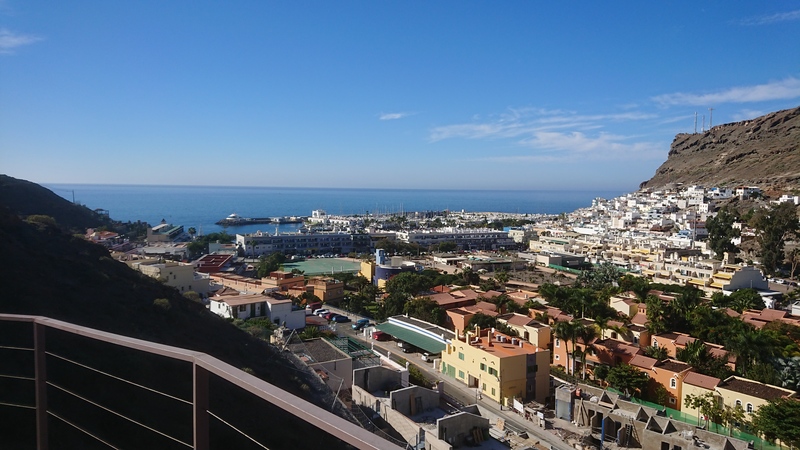 On December 8, 2018, XYL and I traveled to Puerto de Mogan on Gran Canaria. 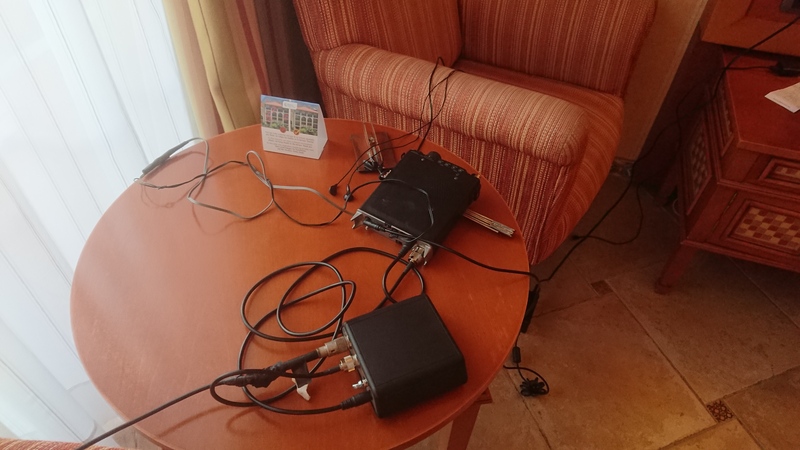 As usual, I brought my FT-817nd. 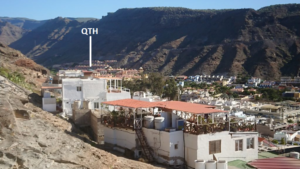 We stayed at Cordial Mogan Playa Hotel, a few hundred meters up the ravine from the village. It was easy to predict that the QTH was not the best with high mountains all around except to the South-West. I checked the take-off angle using http://www.heywhatsthat.com/profiler.html and estimated it to 10 degrees. I judged that it would be possible to work from the bottom of the ravine after all. 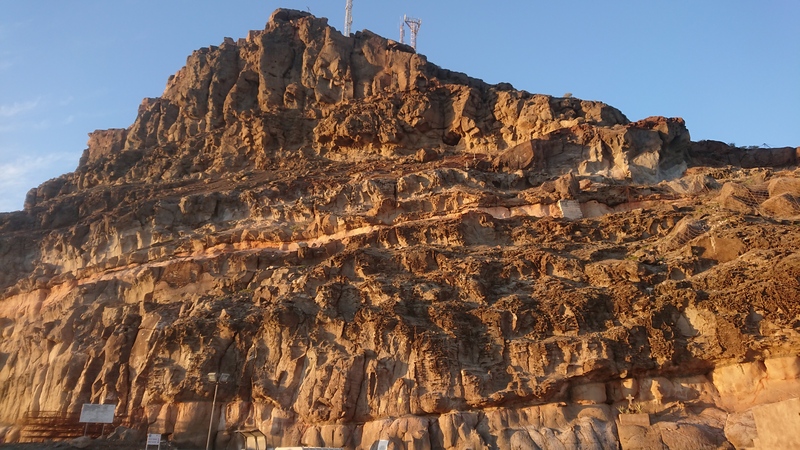 Once in place, the angle from the balcony to the surrounding mountain ridges were measured to 35 degrees to the west and approximately 60 degrees to the east. Against Europe, the angle was slightly lower than 35 degrees. The fishing rod with 5 meters of antenna wire alongside was mounted on the balcony in the southwest direction and pointed upwards at 45 degrees. As a counterweight, the balcony’s steel rail was used. The ATU could match the antenna from the 30 to the 15 meter bands. It turned out that all amateur bands from 20m upwards were completely dead. There was not even any atmospheric noise. However, contacts were possible daily with Europe on 30 and 40 m from an hour before sunset for about 20 minutes. That was from about 1710 to 1730 local time and equal to GMT. The sunset was around 1810. It shows that the radiation angle at that time was very high. The signals probably entered at an angle of 30 degrees above the horizon or more. A very good indicator was the German weather station at 10100 kHz. It went from S0 on the meter to S8 for a few minutes and then quickly fell back again. 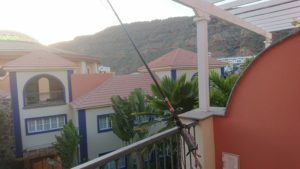 To be able to use 40 m, a 5 meter long extension of the antenna wire was connected from the tip of the fishing rod wire back to the other end of the balcony. It became a fairly pointed angle, but the ATU could match the extended antenna on 40, 30 and 20m. Only EU stations were worked. PY stations were often heard, but they were weak. 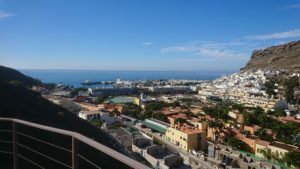 This entry was posted in Okategoriserade on December 18, 2018 by admin. Effective Isotropic Radiated Power (e.i.r.p). What is it? e.i.r.p. = Pout (from TX) – losses (in antenna and feeder etc) in dB + antenna gain in dBi. An inverted vee dipole with apex at 13 m has a gain of 6.7 dBi. 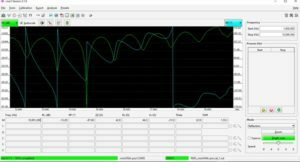 If losses in tuner and feedline amount to 1 dB, Pout should be 5.7 dBs lower than 15 W or 4 W. It holds for an antenna over even ground with average conductivity. For a vertical ¼ wave GP with 2 to 4 radials at 2 m Pout max is rather 30W. This entry was posted in Okategoriserade on December 2, 2018 by admin. This entry was posted in Okategoriserade on March 10, 2018 by admin. 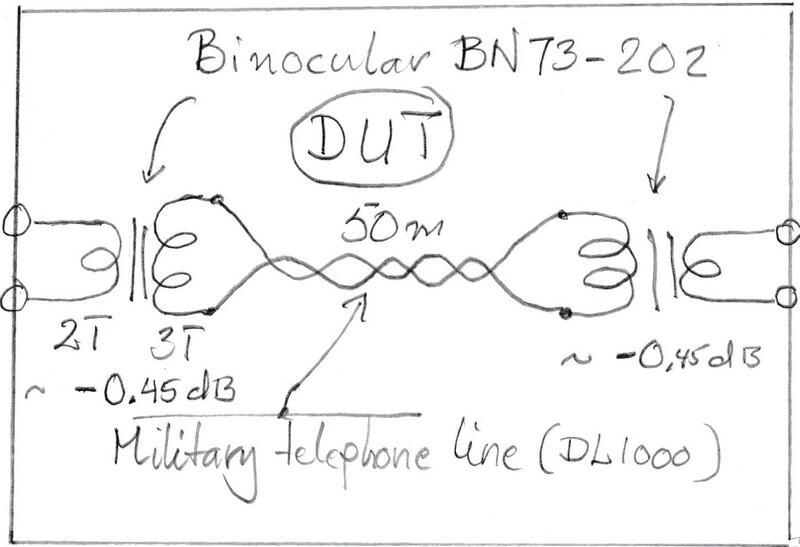 The DL-1000, which is the defense’s telephone wire, consists of 7 strands. 4 from copper and 3 galvanized steel wires and an insulating coating. It is popular as antenna wire. The question is how it stands against copper wire regarding losses on short wave. The MMANA simulation program allows you to select materials in the antenna conductors. 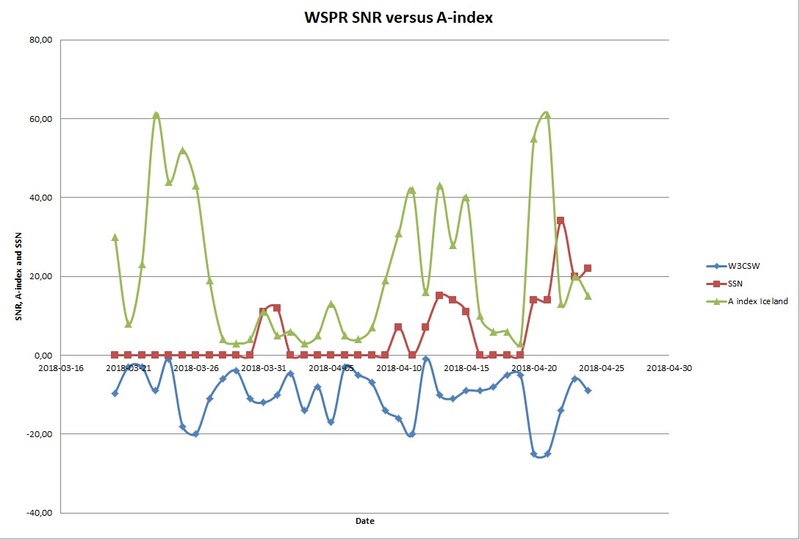 The difference in material losses between copper and steel wire amounts to more than 3 dB for a 20m dipole. To make a practical measurement, a dipole for 14 MHz was mounted with the center 7 meters above ground and the ends one meter lower. A MINI VNA was connected to the 37 meter long RG 213 coaxial cable and the length was retracted. However, the cable is simulated as loss-free. In addition to 1.5 square mm copper, 1 mm plastic coated soft steel wire was used, which is used in the garden. The feed impedance was measured at the resonance point when it was pure resistive. Thus, an additional loss resistance of 11.7 ohm for DL ​​1000 and 21.2 ohm for steel wire. This corresponds to 18% or 0.85 dB extra power loss for DL ​​1000 and 28.6% or 2.3 dB for the steel wire. The DC resistance of a strand of DL1000 is 7 ohms/100m. When I measured a dipole, the feed impedance increased by about 12 ohms when I used the DL1000 instead of the FK 1.5. This means that a 12 ohm loss resistor is in series with the copper wire feed impedance. For steel wire, the corresponding loss resistance was 21 ohms. I then put the corresponding loss resistance in all the current maxima on the long wire. One can see it as 10 series-connected half-wave dipoles. The result was that a 100 meter long wire of 14 MHz with the DL1000 had 1.6 dB of lower gain than an LW of copper! For a half-wave dipole, the corresponding losses were 0.85 and 2.3 dB, respectively. The longer the antenna is, the more important with good material in the wire (and, of course, low losses in the ground). In figures: Gain Cu = 10.7 dBi, Gain DL1000 = 9.13 dBi and Gain steel wire = 8.44 dBi. The latter result does not correspond to what you get if you choose steel as material in the antenna wire in MMANA. Then Gain = 7.1 dBi ie 3.63 dB worse than with copper. The same goes for half-wave dipoles. By comparison, a 3 element monoband has a gain of about 12 to 13 dBi. Gain Cu = 12.16 dBi, Gain DL1000 = 10.18 dBi ie an additional 1.43 (Cu) and 1.05 dB (DL1000) respectively. For steel wire the gain is then 8.1 dBi. Below a 10 wavelength long wire 1 wavelength up on 14 MHz. This entry was posted in Okategoriserade on December 23, 2017 by admin. 1. A 110 m unterminated wire in 290 dgs. Works great for North America. 2. A 185 m teminated wire in 240 dgs. 3. A 130 m terminated wire in 60 dgs. Just a little bit better than number 2. Discriminates signals from SW with about 2 S-units. A bit disappointing. 4. A 120 m unterminated wire in 355 dgs. This entry was posted in Okategoriserade on November 30, 2017 by admin. As reference I connected both wires in parallel connected directly to the measurement receiver. There was no difference with and without the load resistor R.
So the telephone line is OK as a feeder for receiving antennas on 80 and below as regards to common mode pick up but doubtful on 40m. This entry was posted in Okategoriserade on November 13, 2017 by admin. 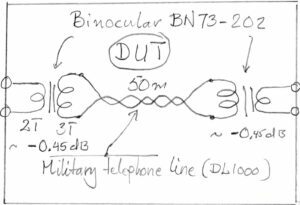 I was using a 50m length of DL1000 telephone cable with a transformer with binocular BN73-202 at each end with a turn’s ratio of 2:3. There was a MINI VNA Pro used in transmission mode connected to the transformers. This entry was posted in Okategoriserade on November 12, 2017 by admin. I’m replacing my Beverage feeding system. The relays in the switchbox was powered through the feeder which was 40 m of buried RG-6 coax plus 70 m of military phone line in the trees. I had problems with noise from the relay voltages so now replacing it with buried outdoor UTP cable feeding the relays separated from the RF feeder. Today Oct 4, the new beverage feeding system is up-and-running. Works as expected but the ground lead is too long picking up too much signal, especially on 40 and up. Had to move the relay unit from one tree to another. Will try to improve that. Today November 8 I improved the ground with an extra ground stake. There is also a new NE wire running at 65 Dgs. It’s a 130 m long terminated wire. This entry was posted in Okategoriserade on September 4, 2017 by admin. On 21st of December 2016 local K-index was 8 (with 9 as theoretical maximum) with severe aurora. Strange things happened. Sort of sporadic E (or maybe sporadic F) was formed by the strong radiation. So had a QSO with W9YXX in Indiana on 20, late in the evening with 599 signals. Normally the band closes early. At such occasions the propagation is very patchy. 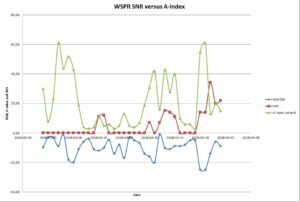 I got a 31 dB RBN spot from WZ7I and a 27 dB spot from K3LR. No spot from anyone else in Europe or anywhere. I was the only EU station heard at his end he was the only station heard here except for C91PA who was 59 on 20, SSB. The noise was virtually zero with the needle stuck at the bottom stop. This entry was posted in Okategoriserade on December 22, 2016 by admin. Tänkte prova 30m-tillsatsen för min A3WS. Den har legat och väntat i garaget i kanske 15 år. Filosofin har varit att passa på och montera den när det uppstod ett problem på beamen och jag skulle bli tvungen att ta ned den. Nu har ett fästband som hållit koaxen mot bommen gått av. Dags att agera. Det visade sig bli ett större jobb än vad jag trott. För att kunna ta ned WARC-beamen måste jag ta ned min dipol för 40m och min trebandare FB-53. Jag tillverkade en linbana enligt tips på nätet. Det visade sig vara lättare sagt än gjort att få ned antennerna. Allting trasslar sig med allting och det som ska fungera i teorin har allvarliga brister när det kommer till verkligheten. Idag har jag i alla fall fått ned 7 MHz-dipolen och FB-53an. Återstår A3WS. Efter ett par veckor sitter alla antenner på plats. 30-meterstillsatsen på WARC-beamen går förträffligt. 25 meters höjd verkar passa den bra. FB-53an har sänkts i frekvens på 20 meter till 14070 kHz. I original ligger den på 14225 kHz. Det förbättrade SWR och F/B-förhållandet på CW-delen. Dessutom monterades 3 cm långa pinnar före trappsen på den närmsta 10/15-metersreflektorn för att försöka förbättra F/B-förhållandet på CW-delen på 10 meter, men det verkar inte ha haft någon större efekt. Inför lågbandssäsongen har en 160-metersdipol hängts upp och ett parasitiskt element har satts parallellt med befintlig Invvee-dipol. Den antingen direktor eller reflektor genom att ändra längde ett par meter. Riktningarna är SV eller NO. Dessutom finns en inverted vee-dipol med bredsidan NV/SO. This entry was posted in Okategoriserade on September 7, 2016 by admin.